Sama is a Delhi-based organization working on issues of women’s health and human rights. A key focus is assisted reproductive technologies (ARTs) and international commercial surrogacy. Sama documents and makes visible the experiences of gestational mothers and the risks they face in international commercial surrogacy arrangements. The organization examines issues within the framework of gender, class, caste, religion, ethnicity, and other power dynamics within South Asian society and between South Asia and other countries/regions. Visit Sama’s website for more information. Aside from the acclaimed film “Can We See the Baby Bump Please?” and report “Birthing A Market,” Sama has produced a vital collection of research on ARTs and surrogacy. ART Policy Brief, critiquing the provisions of the Draft ART Bill of 2010. Constructing Conceptions, documenting the lived experiences of women of different class and caste backgrounds who access ARTs to have a biological child. Unraveling the Fertility Industry (2010), based on an international consultation organized by Sama in 2010, focussing on the commercial, economic, and ethical aspects of ARTs. Consultation on “New” Reproductive and Genetic Technologies and Women’s Lives (2006), raising awareness about ARTs and their implications, potential drawbacks, and collective strategies to combat the issues surrounding ARTs. ARTs and Women (2006), demonstrating how the ART sector cashes on the social stigma of infertility and the patriarchal pressures on women to have a biologically-related child. Visit Sama’s website for a full list. United States The Center for Genetics and Society (CGS) is a public-interest organization based in California working to reclaim human biotechnologies for the common good. CGS brings a social justice, human rights, and public interest perspective to human genetic and assisted reproductive technologies and practices, supporting those that are beneficial and opposing those that threaten to increase inequality, discrimination, and conflict. CGS provides a range of digital resources that track and analyze developments on issues related to the social meaning of human biotechnologies including: a robust website and active presence on Twitter, Facebook, and YouTube; Biopolitical Times, a longstanding blog with staff and guest contributors; and Talking Biopolitics, a series of conversations with leading thinkers, ethicists, and researchers. Learn more and visit the CGS website for a full overview of resources. Their newest project, Pop A.R.T., explores the influence of art and culture on public opinion and policy decisions about biotechnologies. This column includes, among others, a look at the blurred lines between reality and reality TV, musings from a comic fan, revisiting Gattaca in the age of Trump, why we love(d) Orphan Black, and the latest on Bollywood’s birds and bees. Our Bodies Ourselves (OBOS) is a nonprofit organization based in Massachusetts that develops and promotes evidence-based information on girls’ and women’s reproductive health and sexuality. OBOS addresses the social, economic, and political conditions that affect health care access and quality of care. This contextual information has inspired readers to learn more about and to change laws and policies that affect their own and their family’s well-being. The OBOS Global Initiative works with women’s organizations around the world that have translated and adapted “Our Bodies, Ourselves” to their country’s unique cultural needs. Many of these groups are addressing assisted reproductive technologies via their own work and in collaboration with OBOS (visit Global Collaborations for more information). Surrogacy360 is one example of the Global Initiative’s work toward greater transparency and awareness concerning international commercial surrogacy. Is Surrogacy Always a Win-Win Situation, questioning the oft-touted belief that international commercial surrogacy benefits everyone. The Ongoing Tale About the Handmaid’s Tale, highlighting parallels with and points of departure from the recent television series, The Handmaid’s Tale. From In Vitro Babies to Skin Cell Maybes: The Shifting Landscape of Human Reproduction and Family Formation, on conversations and questions about family formation and regulation at the 2017 Baby Markets Roundtable. 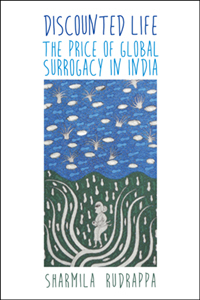 Chasing Global Surrogacy, on the trajectory of international commercial surrogacy in Asia. Bollywood Birds and Bees, on the influence of popular culture on attitudes and use of surrogacy in India. Sharmila Rudrappa is a distinguished scholar in the field and her book, Discounted Life, is the winner, American Sociological Association Asia and Asian America Section Best Book on Asia/Transnational Asia.